Is it twinkling lights? Angels? Stars? 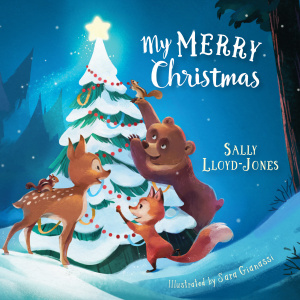 This rhyming story by Sally Lloyd-Jones (the best-selling author of The Jesus Storybook Bible) helps children relate favorite holiday symbols to the true story of Christmas—the night Jesus was born. My Merry Christmas by Sally Lloyd-Jones was published by B&H Kids in October 2017 and is our 44108th best seller. The ISBN for My Merry Christmas is 9781433648953. Be the first to review My Merry Christmas! Got a question? No problem! Just click here to ask us about My Merry Christmas.